As I was browsing, the relationship status portion caught my eye. 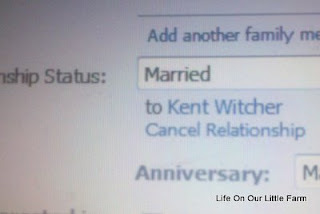 Under the listing of to whom I am wed - it says "Cancel Relationship". That phrase got me to thinking. We have become a society of easy. If it isn't easy, then quit. We can de-friend someone with one click, we cancel marriages with the movement of a finger, we walk out on children because the government will "take care of them". Honestly, I'm not a real political person but the politics of late have really hit home. As a society, everyone wants someone else to shoulder the load. Free food, free housing, free health care. What has happened to caring for yourself and family? I was listening to the radio lately and a woman called in that had been receiving unemployment benefits for over a year. She felt the new proposal to extend benefits to 99 weeks was a step in the right direction but still not enough. The radio host asked her several questions which lead to her stating "I will not deliver pizzas". Why not? It's better to free load off the government than provide for yourself? I understand that pizza delivery boys don't make the income of a former professional. But unemployment benefits aren't that great either. When/How did we become a society that has decided that certain things are beneath us? Why is any individual "above" so much? That person is beneath me, that job is beneath me, that car is beneath me, that store is beneath me - Where does it stop? Relationship difficult - push a button and it's over, no job - rely on the government instead of taking on a undesirable job, don't have the finer things - charge it on a card and then default. What a sad state of affairs.